The Vibrant Orange generally comes in Pelikan’s standard G15 gift packaging which I’ve described in detail in other reviews. It serves its purpose well but really hasn’t seen any revision in some time. Once you open the faux leather pouch contained within and retrieve your new pen, you immediately appreciate just how bright and colorful the Vibrant Orange is, particularly when juxtaposed with many of this year’s other releases. I’m instantly reminded of that small M320 Orange from nearly a decade and a half ago, perhaps now all grown up. As you rotate the pen in good light, you see the material whirl and eddy thereby creating mountainous regions capped with a wonderful pearl essence. The effect brilliantly gives the material a sense of depth and dimension, bringing the M600 to life. As I continue to rotate the pen, I’m pulled out of my reverie just a little bit and think, “Oh no, here we go again.” Just as we saw with the M805 Ocean Swirl (2017) last year, the Vibrant Orange has a dirty secret not well depicted in the marketing photos. While it may be all orange, it is not all vibrant. There are alternating bands that run along the length of the barrel and cap which are darker, duller, and, well, a whole lot less vibrant. Of course there is inherent variability and some pens will display this more dramatically than others. If it truly matters to you, try to get a good look at your intended purchase before hand if possible. As I reflect upon it, I suppose that it is nice to have some counterpoint which allows me to appreciate those areas that are so bright but I also can’t help being disappointed by the effect at times. The gold-plated accent elements feel like the right choice here but they get swallowed up a bit by the surrounding orange. Also, when capped, your eyes see nothing but orange until you get to the black resin piston knob which comes off as a bit unbalanced and somewhat visually jarring. It’s not anything we haven’t seen before as none of these design elements are unique to the Vibrant Orange. To me, the pen looks much nicer when uncapped as the black section helps provide an element of balance with the piston knob. These are all subjective criticisms of course which is why I invite each of you to draw your own conclusions. I will say that the material definitely has translucency which allows for easy viewing of the remaining ink in the pen even in the absence of a discrete ink view window. As such, I would caution you against using inks that have a high potential for staining. 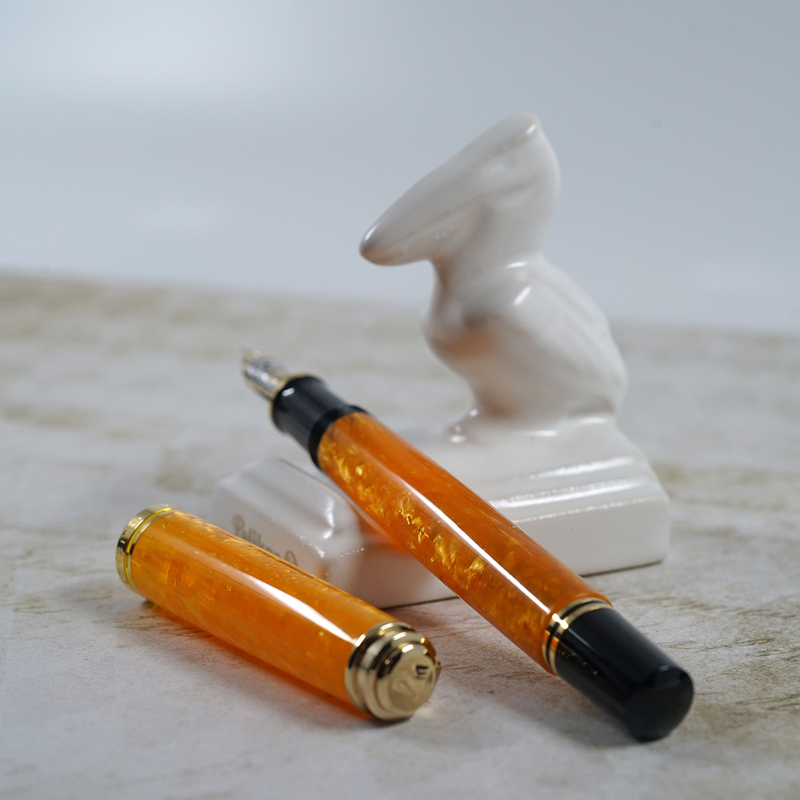 The Pelikan brand comes from a long tradition of quality craftsmanship and the Vibrant Orange is no exception leaving very little to criticize. 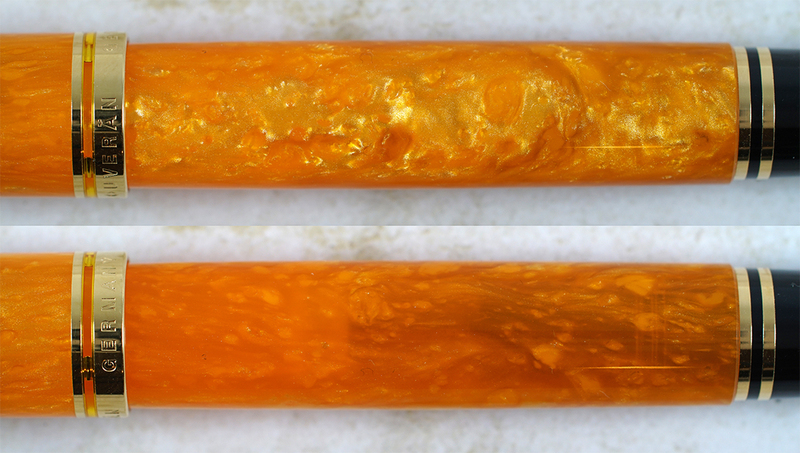 The pen has a very polished appearance and is without seams or other signs of the industrial process. All of the individual pieces fit securely and hold tight. The piston travels smoothly along the length of the barrel. If there is one small area of weakness, it would be the gold-plated trim ring at the section, a feature that has graced every Souverän since 1997. This trade-off between form and function can be prone to corrosion but it is admittedly more of a distant worry that I do not find to be a significant issue with good pen hygiene. Still, I point it out for completeness. The cap posts securely and is without any movement for those of you who prefer to post your pens. Finally, the nib of my pen came nicely tuned out of the box, something that I’ve been very fortunate with on the whole. 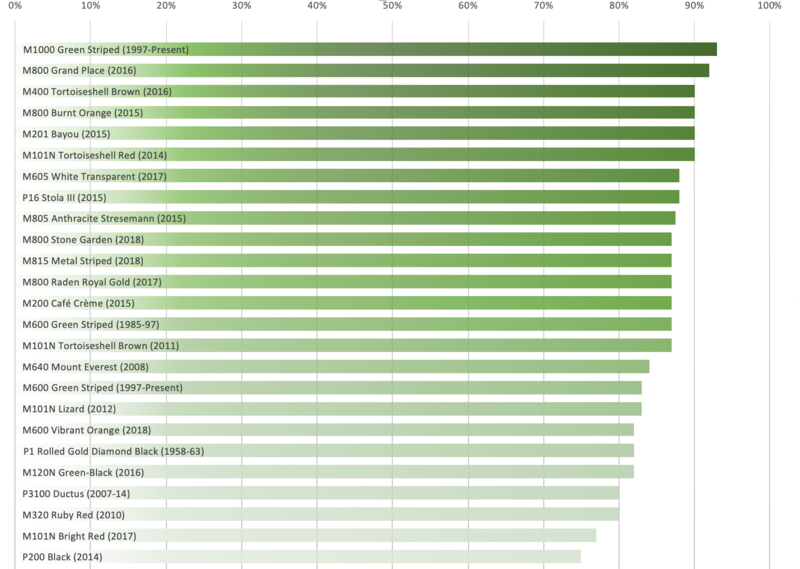 Of course there will be some statistical variability here and that will not be the case for everyone. Most vendors are only too happy to remedy this with a nib swap should it occur. The M600 line serves an interesting role as intermediary, uniquely poised as the preferred size for many. It provides an alternative to the M400 which many find too small but it is not nearly so large or heavy as the M800, a pen whose size many cannot comfortably adapt to. Like other models in the series, the M600 Vibrant Orange measures approximately 5.28 inches when capped, 6.10 inches when posted, and is 0.49 inches in diameter. It weighs in around 0.57 ounces. In general, I find the M600 to be comfortable to use in any configuration though really appreciate it most when posted due to the better balance, weight, and overall feel. The pen’s size also lends itself to travel and I never have to worry about it not fitting in a pocket or case meaning that it’s always on hand when needed. 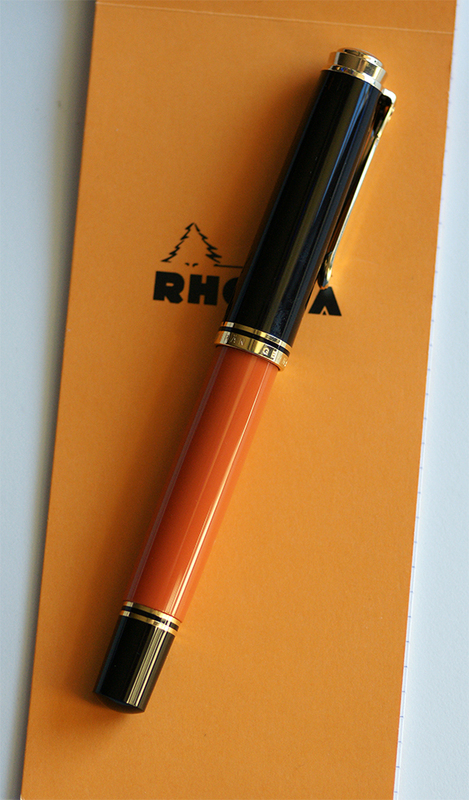 The Vibrant Orange comes equipped with Pelikan’s standard two-toned 14C-585 gold nib. The example that I purchased is of a medium width and puts down a line commensurate with that designation. As I said before, the tines of my nib came nicely aligned and the pen wrote smoothly out of the box. There are no issues with hard starts and the line is very wet and generous, a hallmark of Pelikan’s nibs. The feed continues to impress, resisting drying out, even with extended intervals between use. The elephant in the room for Pelikan since 2013 has been the relative lack of interesting nib options since the oblique and extra broad variants were discontinued. The currently available nib options are certainly very serviceable and all are work horses to be sure but there just isn’t anything inspired about them. The lines they create are devoid of character or flourish and pale in comparison to Pelikan’s past efforts from many decades ago. Of course, there is always after market customization which can breathe new life into any nib and this is one that I may have my preferred nib meister tweak in D.C. next year. Pelikan continues to lead the pack here with their tried and true piston filling system. A single cycle of the piston can net you almost the full stated ink capacity of approximately 1.30 mL. The piston is easily serviced by unscrewing the nib and applying the tiniest drop of pure silicone grease along the inside of the barrel (perhaps every few years depending upon your usage and maintenance habits). Like all Souveräns below the M8xx, the piston assembly is friction fit into the barrel. It is not meant to be removed and doing so can run the risk of permanently damaging your pen. Don’t let that dissuade you though since removal of the piston assembly is almost never indicated and should not be considered a part of routine maintenance. While the piston assembly is fixed in place, the nib is removable to allow for cleaning, swapping, or repair should the unfortunate befall. 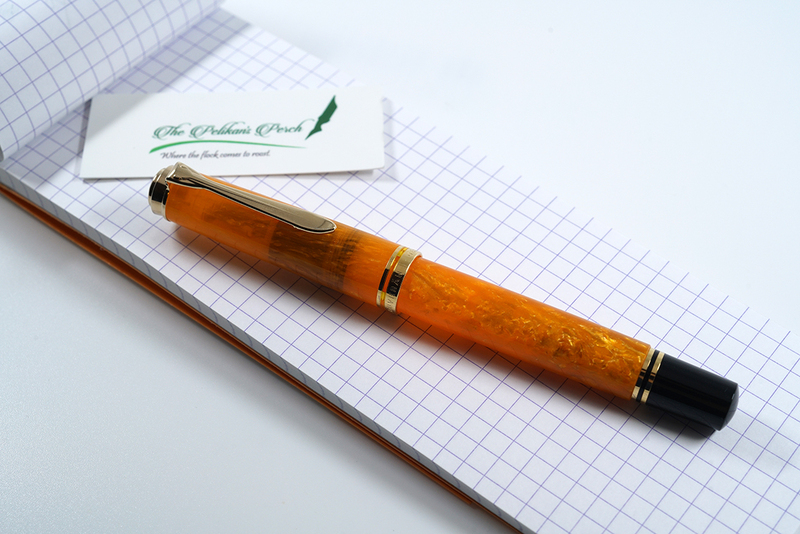 The M600 Vibrant Orange looks to be the first pen available in the USA that is to be subject to Pelikan’s EF surcharge. That means models equipped with a F, M, or B nib will carry a U.S. MSRP of $550 with a U.S. retail price of $440. If EF is your thing, you will need an additional $36 for most vendors (MSRP $595/Retail $476). Not only is this the first model to come with the EF surcharge in the USA, it also has an MSRP that is $75 more than last year’s M605 White-Transparent resulting in a $60 higher sticker price at the sales counter. The best deals for those of us in the USA continue to be found overseas where the same pen can be had for a retail of around $300 to $350 depending on the vendor. You sacrifice domestic warranty support by going this route but the savings, in my opinion, far exceed the value of anything Chartpak offers. Besides, most reputable overseas retailers are only too happy to provide after sales service. I don’t think that a model with an EF nib is a good value and have consequently stopped buying EF, my preferred nib size. I would rather take that surcharge and invest it into a custom grind rather than a stock nib. As for the F, M, and B equipped models, keep in mind that $440 is roughly the same price you can pick up a new M800 for from overseas. That leads me to conclude that this is not as good a value as past releases, particularly when shopping in the USA. The M600 Vibrant Orange is a bit of a mixed bag in my estimation. The awesome orange coloration with bands of exquisite pearl essence provide the pen with an amazing level of depth and complexity. The finish is not consistent throughout though and the detractors, namely the duller bands and black piston knob, could give some pause. The next hurdle is the price which can be faulted at multiple points. Put these two things together and it makes the Vibrant Orange not quite the “must have” that I initially anticipated it being. I think this will scratch an itch for a lot of people out there, particularly those who were enamored of the M320 fourteen years ago. There is nothing fundamentally wrong with the pen itself and I am happy to have added it to my flock. In the end, you will have to make up your own mind about what is important to you. I hope that I have at least been able to show you both the good and bad that comes with this one so that you can make an informed decision. Please feel free to let me know what you think in the comments below. *The pen utilized for this review is my own from my personal collection and therefore the opinions expressed are also mine and free of any undue influence. Thanks Joshua. Great review; enjoyed it. I look forward to seeing it in the flesh, hopefully next week. Hopefully, I’ll be pleased. You’re welcome. Seeing is believing. Enjoy it. Great review, very deeply observed and expressed; my comments on what was perhaps your pet peeve: I prefer the alternate bands of vibrant and not-so vibrant orange textures, they balance each other beautifully. Having just the one would make for a monotonous design- IMHO of course. Your point re the gold furniture getting somewhat lost in the orange, is a valid one. Have Pelikan ever used black as a coating for their bands, clip etc? That would have been an outstanding combo! Thanks. I did think about the counter point of the duller bands as I pointed out in the piece. I just don’t want anybody to be blindsided by it. There is an old M100 in white from around 1987 that Pelikan painted the nib and clip black. It is the only one that springs to mind. 1987 makes sense for black trim. The late 1980s would have been the time when Pelikan was most likely to deviate from their metallic trims. I remember around that time that several models of popular vehicles had black trims around windows, etc., instead of chrome. I think it was a fairly short-lived fad. Just another bit of probably useless trivia that came to mind. As always a great review and the 600 sounds like a great pen. I’m more of an 800 kind of guy tho. :). You also managed to relieve a nagging itch I had over missing the city series. Seeing how translucent the Shanghai is has taken it off my list. Think they will ever rerelease the 800 dark blue?? The Shanghai is very translucent so if that isn’t your thing, you might want to stay away from that one. Great pen but not everybody’s cup of tea. I find the M600 and M800 to be equally comfortable but prefer to post the M600 more than I need to do with the M800. If Pelikan releases a vibrant red m600 next year, sign me up! Yes, I would take one of those as well. From what I know about 2019, I have not heard of any Vibrant releases in the works. Given the pattern thus far, maybe we will see another in 2020. I like the Vibrant Orange quite a bit, just as I like the M300 size, which has a few more streaks of transparency. Now I am ready for them to release the Vibrant Red in M800 and re-release the green and orange in either M800 or M1000, being those are the two sizes I use in my EDC. I don’t think that it’s in the cards for next year and I don’t think that they would rehash either vibrant finish in a bigger bird so close to the original release. We can always dream I guess. I ordered this pen immediately upon seeing its photograph in LCdC’s announcement email. It delights me for two particular reasons: first, it matches my M320 orange perfectly, and second, it is every bit as interesting and beautiful as my M620 City series pens, especially the Athens. In addition, I am fortunate to have a number of “Binderized” M600 size nibs that have increased my appreciation for this most comfortable size bird. The fun now is in trying my various orange inks in this pen. I filled it first with Robert Oster Peach, but will also try Robert Oster Ng ’15, Orange Zest, Direct Sun, and Red Orange, as well as Montblanc Lucky Orange and several Diamine and Sailor oranges. 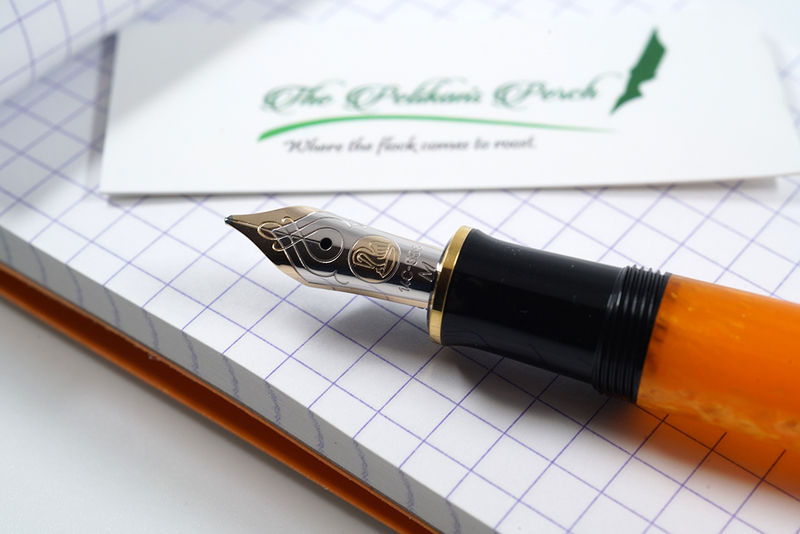 I am tremendously pleased that Pelikan chose this color for the M600 series. You are really swimming in orange ink over there. This sounds like just the pen for you then. I too was reminded of the City Series which is why I shot a pic next to the Shanghai. 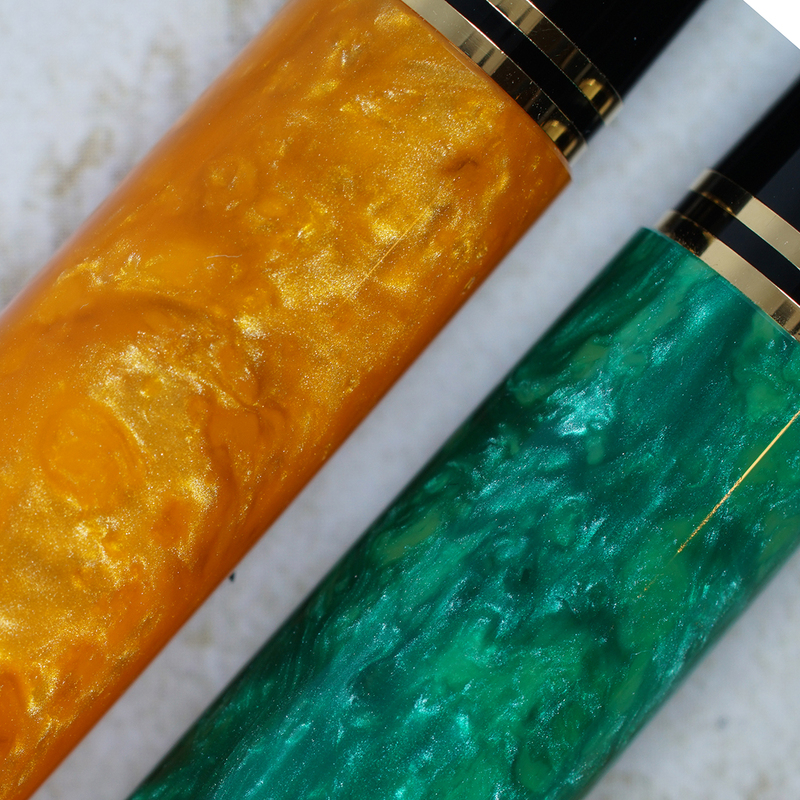 I love it when Pelikan goes all colorful on us. Wish it would happen more often. Thanks Joshua for this thorough review. It looks a beauty in the photos. I have not seen one in the flesh as yet. I hope that you get the opportunity soon. Glad you liked the review. My thoughts as well. I’m glad I added this one and at the price even more glad that I had another B nib customized and ready to fit when it arrived. But my take on Pelikan’s 2018 releases is not as positive as I had expected… perhaps I have all the pens I need? Great post though Joshua, thanks so much. “All the pens I need.” Is there such a thing? Technically you only “need” one. I agree though that for an anniversary year, it fell a little flat in my eyes. I’m actually more excited for what I hear may be in the works for next year. Like you though, glad to have the Vibrant Orange in the flock. I saw one in the flesh at Fahrney’s and have to agree this is not a “must have” color or material. The translucent and gaudy Orange makes it look like tinted Tupperware in regular lighting. Much prefer the classier resin look that m620 San Fran offers. Great review as always. Glad you liked the review. I think this one strikes people differently and it all comes down to individual taste. That perhaps is one of the beauties about Pelikan. If you don’t love this one, you won’t have too long to wait until the next. Wonderfully thorough review, Joshua. You really have a way of pulling it all together as to the overall “value” of a pen. After all that, I still want one. I’m one of those people who can’t get enough color (as long as it’s done tastefully, which I consider to be true of this pen). It’s gorgeous next to the other two Vibrant colors. They really look beautiful together. Darn – you somehow always manage to make me long for birds that came onto the scene before I collected fountain pens. I guess I’ll just have to tell myself (yet again) that I can’t have ’em all! But if it becomes possible, I will be adding this one to my flock. I really like the translucence and pearlescent quality of the material, including the contrast afforded by the alternating bands. Besides – my M320 Orange needs a big sister! Thanks. I’m glad that you want one. It’s a great pen. I wasn’t seeking to dissuade people from it but rather point out the few warts and allow people to make their own judgement. The Vibrant Green can still be found at auction from time to time if you keep your eyes open. Not nearly as rare, in my experience, as the Ruby Red has become. Thank you very much for the excellent review, especially the information about the pattern variability. I cited it when ordering mine so that the dealer could understand my real concern. They took it seriously and sent me photos of the proposed pen for approval before posting. Now it’s in transit and I don’t have to worry. Great! That’s exactly what I was shooting for, helping others to stave off disappointment. Enjoy your new pen! Mine arrived today and I love it; ‘Pen & Ink’ in Brisbane did a great job, the non-vibrant areas are not large and ugly, so the pen looks great. Great! Glad you got one that you’re happy with. Enjoy it. Excellent review as always. I’m curious about the Sundowner ink you used with it. How does it compare to Iroshizuku Fuyu-Gaki and/or Noodler’s Habanero? It’s a great color but I can’t compare it to the others that you mentioned as I have not used those. I don’t get a lot of occasion to be colorful in my line of work. Having just received my eagerly anticipated Vibrant Orange, I thought I would add a few comments to this thread. The pen is gorgeous to look at and meets all the usual high manufacturing standards one would expect from a Pelikan. However, for me, there is a slight defect in the design. 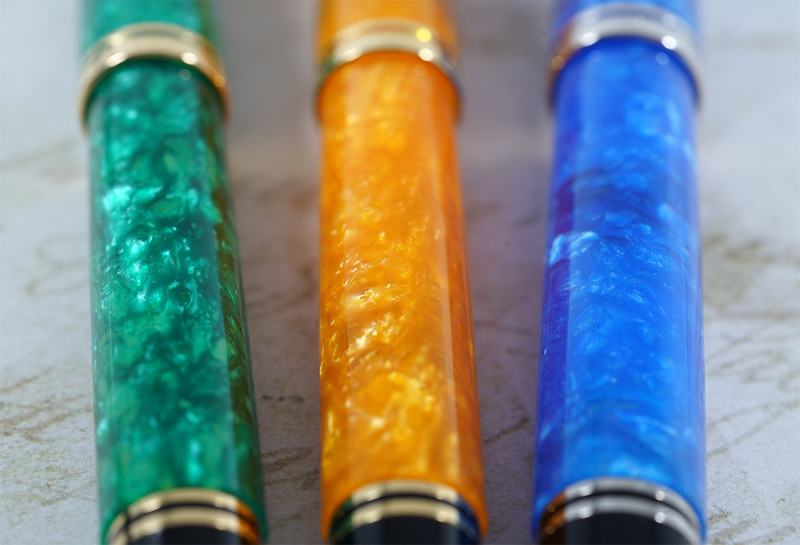 The pen is very translucent and, when empty shines and shimmers beautifully. I filled it with a deep burgundy ink (Kyonoto Iro “Bengarairo”) and was disappointed to see the ink creating a dark smudge through the barrel. If the body of the barrel had been slightly thicker, this would not happen. The “solution” is to fill it with a lighter coloured pen, e.g. orange or mandarin, but I find such inks rather difficult to use for ordinary writing so, for me, it is not a solution. It is unfortunate that the aesthetics of the pen are somewhat spoiled by this defect. I am still glad to have it in my collection but regret this defect in the pen’s design. Have others had the same experience? Thank you for sharing your experience. I’m glad that you are happy with the non-inked look of the pen. I think that I would disagree with your terminology though. What you describe as a “defect” I would say is more aptly described as a characteristic of the material that is not to your liking. This is an issue with any translucent pen, some more than others. I’m sorry that the inked aesthetics aren’t to your liking but I hope that you can find a work around that is agreeable to you. I have avoided this by using light colored inks but have many pens to choose from so it’s not really an issue for me.